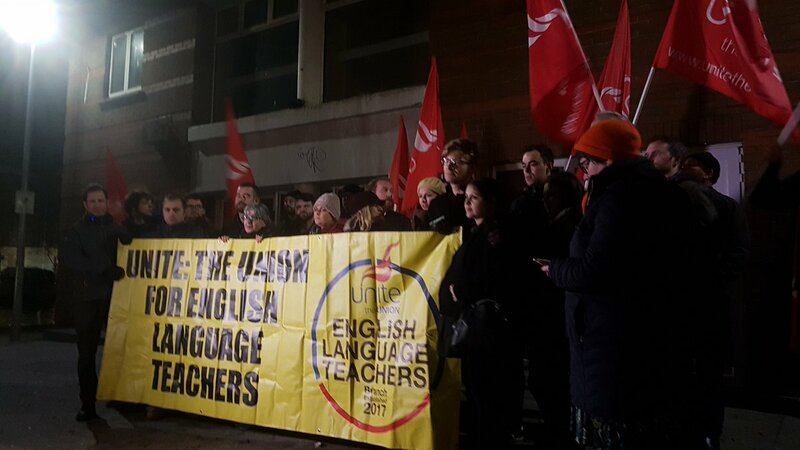 Members and supporters of Unite’s English Language Teacher branch held a protest outside Grafton College this evening in solidarity with teachers who have been left without wages following the sudden closure of the school. Unite represents a number of the teachers, who were not paid on Friday and are now owed a month’s wages, while students have been left stranded after paying fees of around €2,000. “It is not in the interests of teachers, students or the wider economy that rogue employers be allowed to continue operating in the English Language Teaching sector. Unite members and supporters will be protesting outside Grafton College this evening in solidarity with teachers who have been left without wages or employment in the run-up to Christmas. “The Qualifications and Quality Assurance Bill will be debated in the Seanad on Wednesday, and I would appeal to all Senators to look at what is happening in Portobello and support amendments designed to ensure minimum employment standards for English Language Teachers. This legislation, with the amendments, needs to be fast-tracked in the interests of the sector as a whole”, Roy Hassey concluded. 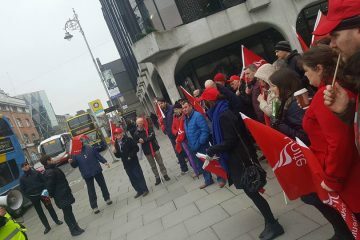 Update: Teachers have since occupied the Portobello premises demanding that Education and Skills Minister Joe McHugh visit the college and speak to the teachers, that the Qualification and Quality Assurance bill be fast-tracked and amended to include minimum standards of employment for teachers, and that the owner of the college, Saeed Rehman, engage with them regarding the monies owed.